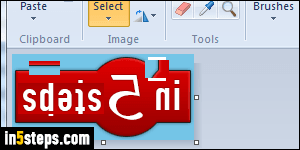 Microsoft Paint, which comes pre-installed on Windows 7/8/10 (and as far back as Windows 95, in its last incarnation), is deceptively powerful for a free and easy-to-use, basic graphic editing tool. 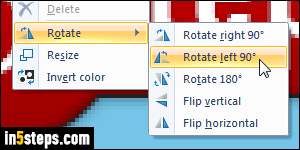 This tutorial shows you how to use the Rotate and Flip commands, which are often confusing to beginners. Rotate is easy enough to grasp, it turns the image around in 90-degree increments (one quarter of a circle at a time), and the flip commands apply a mirror effect. Trick: if nothing's selected, or the entire image is selected, the entire picture will be rotated. 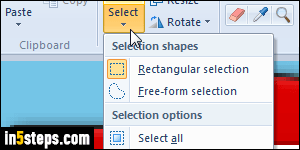 But if you use any of the selection tools (Rectangular selection, Free form selection, Transparent selection - with or without Invert selection checked), your rotation operation will only apply to the selected area. That means that you'll potentially end up with space filled in your background color if you aren't rotating an exact square (overlapping / missing areas). Remember the "Rotate 180" choice? That means that if you turn your head upside down, you'll still be able to read any text. The "Flip vertical" command is different: it will essentially apply a mirror effect. To illustrate, here's the in 5 steps logo after being "Flipped vertically" by MS Paint. Event with your head upside down, the text is hard to read because of the mirrored effect!